It's really important to find agent that you trust to handle your insurance. Hoya insurance is very knowledgeable in regards to insurance auto and housing. I've been with Hoya insurance for about 3 years now. I've never had a bad experience with them. I've also recommended other family and friends to their company. Highly Recommended! - Jason L.
Hoya Insurance is the bombdiggity! They really know how to take care of you, from the lil pups/pets/kitties to your important things, like house, car, and family! Highly recommended. Give them a call for all your needs :) - Mandi T.
The Best Insurance agent I ever met. Super nice customer service, treat clients like family. I have GREAT experience with them. They answer all my questions quickly and help me in anyway they can. 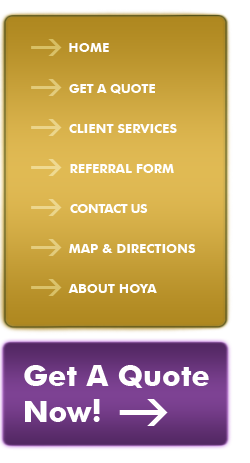 If you haven't found a good insurance agency, you must try Hoya!!! - Eva C.
I've been with Hoya Insurance Agency for 6 years now. I couldn't imagine going to anyone else because they treat me great! They're polite and always there when I answer. Give them a chance, you won't be disappointed. - Ben N.
Hoya Insurance Agency Testimonials and Reviews by IWantInsurance.com.